While I’ve read and enjoyed Ann Leckie’s Imperial Radch trilogy, I confess I probably wasn’t as enamored with it as the majority of readers. Despite the inventive and original ideas and the brilliant way there were executed, I really struggled with the pacing and there were also times where the narrative style made me feel completely out of my depth. 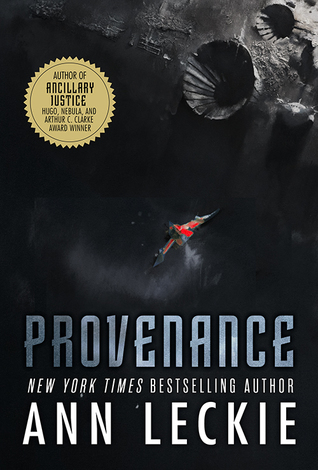 And so when Provenance came out, I felt torn as to whether or not to read it. Eventually though, I was won over by the exciting premise as well as the general consensus that this was a lighter, more approachable story, and easier to get into compared to Ancillary Mercy. For the most part, I felt this was true. The novel follows Ingray Aughksold, the adopted daughter of a prominent politician on the planet of Hwae, where power games are the norm. Our protagonist’s mother Natano has the choice of passing down her title to only one of her children, and Ingray desperately wants it to be her, though she knows the competition will be fierce. Her main rival is her clever and charming brother Danach, whom many already think has secured the inheritance, but unbeknownst to everyone, Ingray has one last-ditch card up her sleeve to play. For you see, in Hwaean society there are certain historical relics called vestiges that are prized above all other treasures, and a thief named Pahlad Budrakim is said to have stolen some and hidden them away before being convicted and sent to “Compassionate Removal” (a punishment that involves a rather horrible form of exile). If Ingray can somehow free and convince Pahlad to reveal the location of the stolen vestiges, she can simply retrieve them and return home a hero. Sure, her plan may be half-baked and nothing short of a gamble, but pulling it off would certainly win her Natano’s favor. Unfortunately, things go wrong almost immediately for Ingray as she arrives to retrieve Pahlad (after paying a hefty sum, which was almost all the money she had), only to find the prisoner delivered inside a suspension box. She also did not anticipate that the starship captain she hired to take them home would object to transporting a passenger in stasis, insisting that she wake the prisoner before he would agree to take them anywhere. So imagine Ingray’s dismay, when after they breach the suspension box, the person within comes to life in a bewildered state, claiming vehemently not to be Pahlad Budrakim at all. Returning to the Imperial Radch universe, Provenance does share a few similarities with the Leckie’s debut trilogy, such as the gender-fluidity, lack of emphasis on sexual stereotypes, inclusion of many different alien races, and presence of sentient machines. However, as evidenced by the book’s description, the story also contains a more accessible and reader-friendly plotline, one that concerns itself more with intimate matters like family and friendship. This is just one of many reasons why I think this novel worked better for me on a personal level, in contrast to the way I felt about Ancillary Mercy which left me with a nagging sense of detachment to the characters. Ingray, on the other hand, was someone I found easier to relate to, which in turn helped me gain a deeper appreciation for the world-building elements. While Leckie can sometimes go a little overboard with the details (something I also noticed from previous experiences with her work), the data dumps seemed much more manageable this time around, probably because almost all the world-building had direct consequences for our protagonist. Every background tidbit on the culture of the Hwaeans or the history of vestiges meant something to Ingray’s future, for example, resulting in a greater interest and investment on my part. And yet, for all its strengths, Provenance still presented me with a few roadblocks. Its lighter tone notwithstanding, the story was slow to unfold and failed to build up much steam after the first hundred pages. After a promising start, everything just sort of…plateaued. To be fair, the story did interest me enough to keep reading to the end, but my feelings for the second half of the book were much more muted compared to the gripping excitement I felt in the first half. It has occurred to me, of course, that Leckie could be one of those authors whose style and I simply don’t click. I’m always conflicted whenever I finish her novels, reeling in awe and admiration of the story’s themes and concepts, but at the same time wishing it could have been more. And that’s pretty much how I felt about Provenance in a nutshell. I think it’s an intriguing book that expands the universe, making it a must-read for Imperial Radch and Ann Leckie fans, but once again I’m on the fence. Isn’t it really unsatisfying when you just don’t hit it off with an author’s style even while you want to really like their stuff? Yeah, I’m glad I read it. I probably wouldn’t have picked it up if it hadn’t been an unsolicited ARC though, since I already had it on hand. I don’t know if I’ll actively request her next novel, now that I know her style and I don’t really click. Yeah, if you’re not really into heavy or hard sci-fi, her books might get a little too overwhelming. We’re 100% on the same page about this. Yeah, I read your review, and I see we agree on many points. Yeah, I’d already decided not to pick this up. I didn’t get on with the previous series – in fact your phrase about feeling out of your depth hit the nail on the head for how I also felt. I’ve just decided that I’m probably not going to get on with this author’s writing style which is fine – although at the back of my mind I always want to keep on trying, especially as so many others love these which makes me feel like I’m missing something fundamental or simple. Yeah, not only did I feel out of my depth, I also felt a cold disconnect with the characters and the story overall. Parts of the first trilogy really bored me. It didn’t leave me excited or enthusiastic about what would happen, the way a good book does when I’m really immersed. If you enjoyed her first trilogy, I think you’ll enjoy this! Hmmm, I haven’t read any of her stuff, maybe I’ll try it and see if this one clicks with me. It’s a lot easier to get into that her first trilogy, I’ll give it that! So it might actually be a good place to start. Leckie is one of those writers who I follow online and I agree with much of what she says and much of her views on the publishing world. but I read her work and it simply does. not. work. for. me. I got about 20 pages into Provenance and stopped reading. I’m glad I’m not the only one! I’m the same way with some authors. I love their personalities online, but I just can’t get into their books! I really want to read this – I’m particularly excited that it’s a standalone – but I feel like I have to read the Imperial Radch books first. I have them sitting on my shelves and I really want to see what all the fuss is about! Leckie seems like quite a polarizing author.